The Foodcommander is the creation of NY-based private chef and performer Daniel Isengart. This being the season of comfort food, The FOODCOMMANDER proposes a simple wintery dish of rice and red lentils, so easy and fast to make and so comforting in flavor and overall wholesomeness that you might resolve to make it once a week as a vegetarian respite from other omnivore endeavors. Red lentils are skinless and split but, unlike split peas, they are highly aromatic, easy to digest, do not require pre-soaking, cook in less than 15 minutes, and retain a vibrant color. Don't underestimate the stimulating power of colors on your plate - another reason to never ever use colored or patterned plates: Let the food carry the message. Like most stews, this one starts with the frying of a combination of diced aromatic vegetables. The FOODCOMMANDER recommends the classic Italian soffritto: onion, carrot and celery. Green bell pepper, which is part of the classic Spanish sufrito, is not recommended, its strong flavor is a bit too pronounced for this subtle dish. But if you ever wondered what to do with the tough stalks of a fennel bulb, this would be a good way to put them to use. Set the feathery fronds aside for later - it would be a pity to cook those. Place your best cooking pot, a dutch oven or cast iron pot with a lid, on high heat, add a little extra virgin olive oil, then the diced onion, about one heaped cup. Fry until translucent, then add the other diced vegetables (about another cup total), along with a generous tablespoon of cumin seeds, which you ought to crush between your palms to release their fragrant oils. After some light browning has occurred, scrape vegetables to the sides of the pot, add a bit more olive oil to the center of the pan and immediately squeeze some tomato paste onto it (yes, you ought to buy tomato paste in a tube as opposed to a little can, lest you want to feel obliged to use the entire can each time you open one - who likes a aluminum-foil-covered tin can in the refrigerator? The FOODCOMMANDER shudders at the very thought of it - and any aesthete worth this denomination may join in in the shuddering). Leave this untouched for a little while so that the tomato paste can caramelize (thank you, Mario Batali, for showing everyone this crucial bit, once, years ago, on your original cooking show on the Food Network). Now addone heaped cup of red lentils, stir just to combine, then add two and a half cups of water, stir, bring to a low simmer and cover. Stir carefully again after 5 minutes, add a bit more water if it seems dry, and simmer for another 3 to 5 minutes. The lentils should still hold their shape and have a faint bite. Season with fresh-squeezed lemon juice and salt. 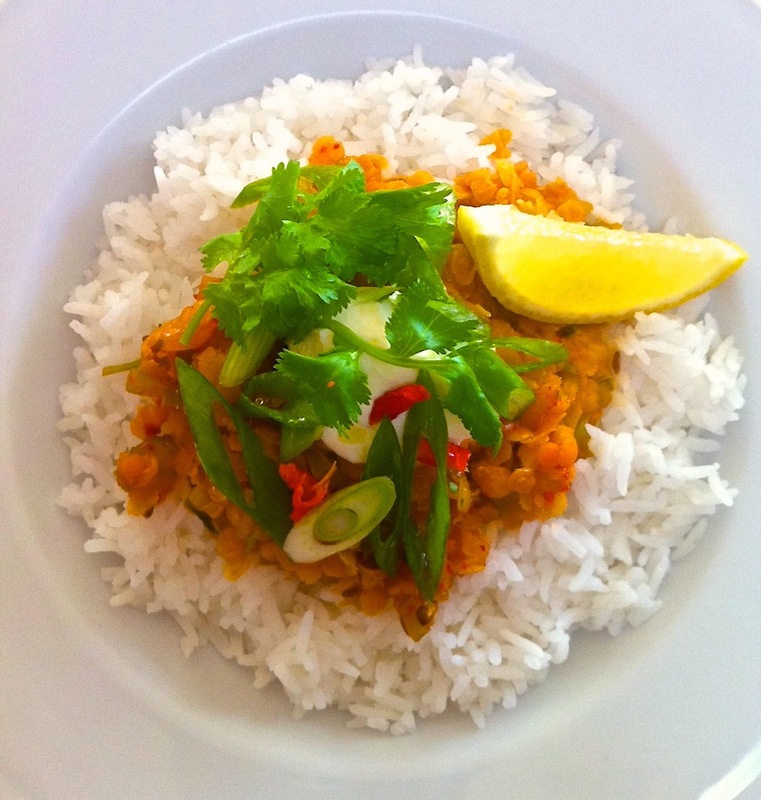 The rice of choice for this dish is Jasmine rice - but you may treat Basmati rice the same way. Here is a fairly foolproof way of cooking either. It may seem complicated but it's worth the effort as it yields highly fragrant, fluffy tender rice kernels every time. Once you've mastered this technique, overcooked sticky rice or flavorless parboiled rice will be thing of the past in your household. Pour the rice, about ½ cup per person, into a mid-size mixing bowl, fill with lukewarm water and gently swirl the rice around with your hand. Let the rice sink to the bottom of the bowl and pour out the water. Repeat until water runs clear, about 4 times. Now cover the rice with cold water and leave to soak for a minimum of 5 minutes and up to 3 hours. Fill a mid-size pot to two thirds with water and bring it to a boil. Add a little salt, not as much as you would for pasta, then the drained, soaked rice. Once the water is boiling again stir once to break up any lumps. Turn heat down to medium and cook until rice is about half-done, i.e. still quite all dente. Depending on your rice and soaking time, this might take no more then 3 and up to 6 minutes. Drain the rice in a colander, put the empty pot back on the stove and add enough water to generously cover its bottom, bring it to a boil, add the rice in a heap. You may also add a couple of aromatics such as whole cloves or, better yet, a couple of dried whole limes, pierced in several spots. Immediately cover the pot with a double layer of paper towels and a tight-fitting lid. Turn heat down to the lowest setting and leave rice to steam for about 10 minutes. Turn heat off and wait another 5 minutes before gently fluffing the rice with a fork. Cover again with fresh paper towels and the lid, until ready to serve. Note: Every kind of rice is different. Do not attempt to do this with short grain rice. The rest is assembly work but, here as well, details make all the difference. Pile some rice into individual deep dishes, make a well in the center, ladle red lentils into it. Top the lentils with a dollop of Labné, Lebanese Kefir-based cream cheese, or thick Greek yogurt, or even a slice of mild, plain goat cheese. Don't even think of using any non-fat dairy product - they are an abomination. Non-fat yogurt, for example, is nothing but chalky goo that The FOODCOMMANDER would not even use to spackle a cracked wall with. If you're afraid of dairy calories, then skip the dairy! Top the dish off with a gratuitous sprinkling of chopped greens - fennel fronds, celery fronds, cilantro, parsley, dill, spinach leaves, sliced scallions - whatever you have, all are welcome. A few slices of fresh jalapeño or a pinch of dried chilies will spice things up. Drizzle with a bit of your best olive oil, add a lemon wedge, and serve immediately. Tip: Left-over stewed lentils are an excellent base for a delectable soup. Simply heat with some chicken or vegetable broth, puree in blender and serve with croutons and more chopped greens.